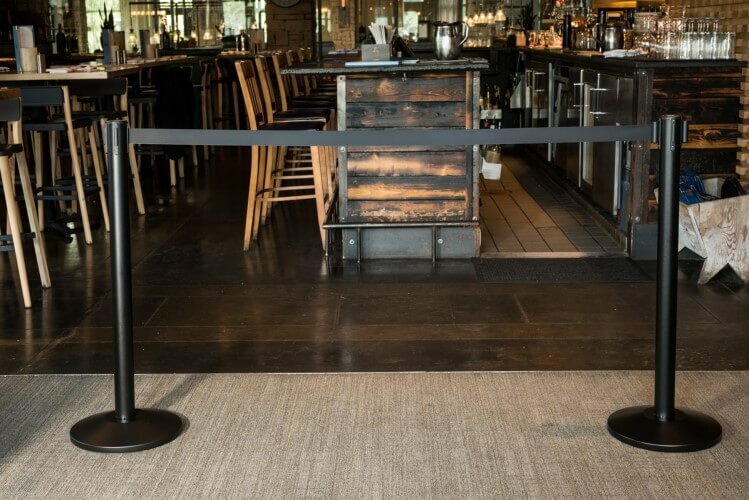 Our Retractable Belt Crowd Control Stanchions are quick and affordable! Used by banks, movie theaters, airports, casinos, and ticket counters for their effectiveness and ease of use. Choose from a Black Powder Coated finish (slightly textured to hide finger prints better), or a classy Polished Chrome finish with a mirror-like shine. Your choice of a Black, Burgundy, Red, Royal Blue, or Yellow belt color. Features an 8 foot long retractable belt that retracts slowly and with more control when compared to stanchions without a brake mechanism. Is 40 inches tall when assembled, four inches higher than common 36 inch tall stanchions. Has a protective floor guard installed along the circumference underneath the base to help protect flooring from scratches. Assembles in seconds by simply screwing the post and base together using one screw and two washers (included).